You keep hearing me say that LinkedIn is the go-to place for growing your business. Whether you are trying to expand your reach, discover new talent, or stay up-to-date on industry happenings, LinkedIn is your one stop shop for all of it. But, is there a right and a wrong way to go about growing your business on LinkedIn? There most definitely is! Below, you will find 20 DOs and DON’Ts to keep in mind when creating your LinkedIn growth strategy. DO share your LinkedIn URL everywhere to encourage connecting with your current customers and business associates. This includes adding your URL to business cards, email signature, live stream broadcast profiles, etc. Authentic connecting is key. DON’T send connection requests to perfect strangers only because you want to grow your number of connections. 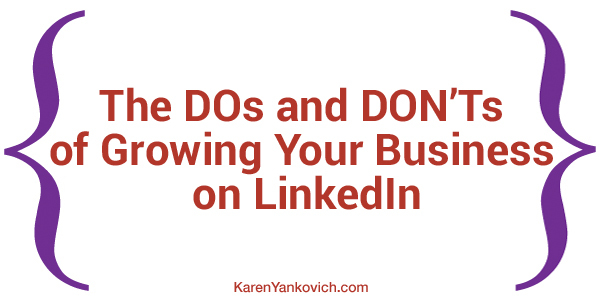 Doing so can lead to complaints, and with enough complaints you’ll be banned from LinkedIn. DO send messages to people thanking them for connecting with you. Find something in their profile you can mention so they know it’s not a copied and pasted message (even though it likely is, just personalized!) It’s a great way to engage quickly with new connections. DON’T immediately message new connections about YOUR products and services. DO make sure your profile is “client facing.” Let people know what you can do for THEM. DON’T list your accomplishments just to impress or brag. List them to position yourself as someone worthy of your followers’ time. DO tell your new connections where you first came across them! Build upon that common link. DON’T use the default connection request when reaching out to someone. Be sure to personalize the message to better catch the attention of the recipient. DO get written recommendations from past clients or business partners. DON’T forget to write an engaging summary to include in your profile. DO post a professional photo of yourself in your profile. DON’T just list facts and figures about your positions. Describe the work that you did, paint a clear picture of your responsibilities and accomplishments. DO write an eye-catching headline and insert emojis to standout in the crowd. DON’T neglect your privacy settings. Make sure you’re aware of the settings and change them as necessary. DO take the time to nurture the connections you make, build upon your commonalities, and grow your network the smart way. DON’T forget to save all those business cards you collect at conferences and meetups and connect with these people when you get back to the office. DO join groups and engage with fellow members by posting new discussions or commenting on previous posts. DON’T miss a chance to communicate with your connections. Comment on updates they make, congratulate them on promotions, and stay in the know on what’s happening with your connections. DO regularly post status updates on your page. Engage your connections, talk about your business, ask questions and encourage interaction. DON’T forget to add keywords to your profile. Think of the words that people will search for when looking for the service or product you provide. Incorporate these words and phrases into your profile. Growing a business can take time. But, with the proper LinkedIn growth strategy and tactics in place, your network will grow, opportunities will arise, and you and your business will reap the benefits. Have any other dos and don’ts to share? Jump on over and join my LinkedIn Group and let us know! As always Karen, good tips simply stated.